I think it’s fair to say that Nick and I have dealt with more than our fair share of “lemons”, and we have done our very best to “make lemonade” of it. We’re only four years into our marriage, and I know we have lots of trials ahead of us – but the fact that we’ll never “be out of the woods” with Evanna has made me feel like we should get a “free pass” on what I consider the more common lemons (if you get what I’m saying) …at least for a little bit. Don’t get me wrong, we have had many blessings bestowed upon us, and life is somewhat good right now (at least when you compare it to our 2014/2015), unfortunately it’s hard to not be disappointed when you feel like your family deserves nothing but a big fat break. As a couple, we had always decided that once Evanna was discharged and I was back at work, that we would work on expanding our family again. We love being parents, and felt that we were more than ready to add another child to the family. We were cleared by genetics a long time ago (Evanna’s chromosomal deletion that cause her heart defects was completely random), and we feel a sibling would be so great for Evanna. Recently we started trying for another baby, and were pleased that just like Evanna, that we got pregnant right away. We were so excited, and began to tell close friends and family as we saw them in person (we told most of our family during Evanna’s 2nd birthday party), and would make it public once we got our family photos done at the end of June. I knew which hospital I wanted to deliver at, had an OB picked out (with the help of some connections), and made all the appropriate arrangements for blood work and ultrasounds. June 7th was my first ultrasound, and was so excited to get this formality out of the way. Now, I’ve had my fair share of ultrasounds and ECHOs with Evanna, and kind of know what the whole thing entails. During the ultrasound I could definitely see my 7 week uterus in in front of me, but I began to wonder where the heck the fetus was, and if I was missing something. Finally the doctor came and talked with me. He informed me that while I was indeed “pregnant” (again, my uterus was measuring at 7 weeks), it looks like it was not a viable pregnancy and for some reason, the pregnancy did not take. It happens and it's actually quite common (1 in 3 pregnancies end in miscarriage), and so I guess I learned that I too am not immune to common things either. I did my best to end my conversation with the radiologist as quickly as possible (I’ve had more than my fair share of “genetic talks”, and so I wasn’t interested in having another one), and I’m pretty sure I left them puzzled at my lack of emotions. It’s not that I wasn't upset and disappointed (because I truly was), but when you’ve had more devastating ultrasounds and conversations with doctors, you become somewhat desensitized to them. I got into my car and drove home to inform Nick (he was with Evanna) of the news. He was very upset when I told him, and we just hugged and cried for a few minutes, not saying much else the rest of the evening. 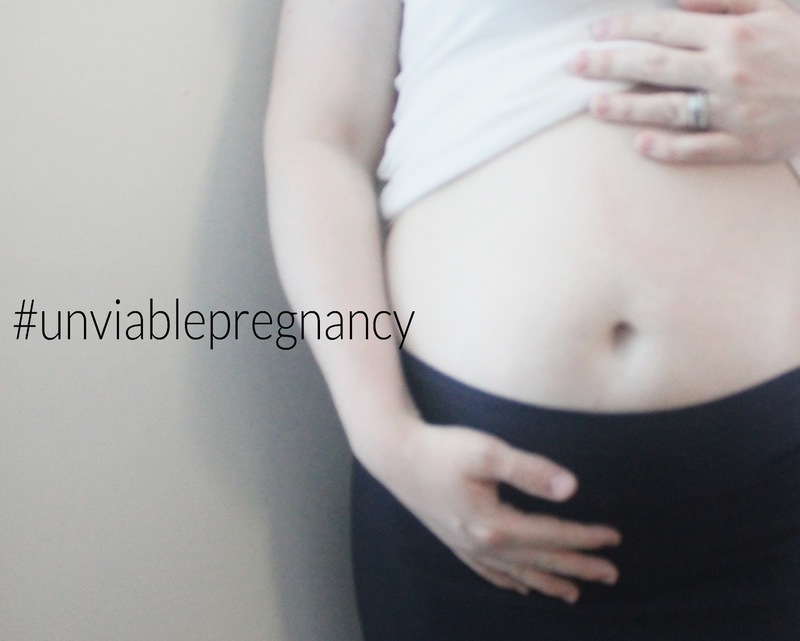 We both agreed that while we were disappointed by the turn of events, that things could be worse (miscarried much later into my pregnancy, etc), and that obviously we will just have to wait a little longer for another baby. The week or so following was a little emotional, and I’ve experienced a few waves of different emotions. To be honest, there have been a few moments of anger and frustration. In my opinion I feel we have followed all the rules and done everything “right”, yet we keep getting thrown these huge curve balls. All of our current life trials are not of our own doing (I may or may not have some strong personal opinions about people who are in a pickle of their own doing from poor decision making… but that’s a different topic), and so I guess I’m somewhat at a loss as to what more Heavenly Father wants from us. Excuse me while I have a little Job (think popular bible story) moment. As of today, my body is still technically 9.5 weeks pregnant, but there is no fetus and I’m still waiting for my body to figure that out and begin the miscarriage process (and yes, this means I am experiencing all the regular pregnancy symptoms – up until last week, that was morning sickness; and this week I’ve begun to start “showing”). If it does not happen in the next couple of weeks, I believe I will either be prescribed a medication that will kick-start the process or eventually proceed with a D&C (this is worst case scenario…but our family has a pattern with those). I am going away for a little heart mama retreat with some friends the second week of July (which means oodles of daddy/daughter time for Nick and Evanna), so I’m hoping this will sort itself out before I leave. We will then concentrate on moving to our new house next month, enjoy our summer plans that we have in store (hopefully Miss Evanna continues to behave herself), and continue to focus on Evanna and her recovery. We will try again when the time is ready, and hope this is just another little blip in this thing called life. Thank you so much for reading this. I’m aware that this is a very sensitive topic, and l also know that my individual view of it may be a little different from others who have/are going through the same thing. I definitely know that I am responding to this situation much differently now then I would have before Evanna. The experiences I have been through over the past several years have definitely changed the way I think and the way I perceive a lot of things right now…but this too is another topic for another day. Thank you for sharing this. Thinking of you. Thank you so much for sharing. I know one day I'll be on the other side of all this and see the bigger picture. I know miscarriages are just absolutely devastating for many, and again while we are disappointed, I guess I was surprised that I was more just disappointed and know it wasn't the end of the world. Thanks for the love! I'm so sorry to hear about all of this. My prayers and thoughts are with you right now. I found it wasn't until months later that it really set in for me. It was at that point that depression and grieving began. I would never hope someone else's experience was similar but even years later there are days my heartaches for what was lost. I enjoyed your post and your honesty. Good luck with the move!